The law firm of Andrew Dunlap Attorney, PLLC, in Irving, Texas, is a boutique firm that focuses on labor and employment law. With over 40 years of experience, attorney Dunlap stands ready to aggressively and diligently represent clients throughout Dallas County. Whether his clients need advice and counsel regarding mergers, acquisitions, strategic partnerships, exit strategies, government procurement, risk management, energy management, insurance coverage and disputes, or document management, attorney Dunlap has the knowledge, skill and experience necessary to meet their needs and help them achieve their goals and objectives. His law firm provides free initial consultations and accepts credit cards for his clients' maximum convenience. Attorney Dunlap earned both his Juris Doctor and his Master of Public Administration at the University of Kansas. After graduation, he served as a budget analyst in the City Manager's Office in Kansas City. He then joined the United States Air Force, where he served as a Staff Judge Advocate. His roles included those of Area Defense Counsel, Chief of Military Justice and Regional Claims Officer. On entering private legal practice, attorney Dunlap gained extensive litigation experience, particularly in the banking and media industries, and established a network of over 85 private equity and pension fund consultants. 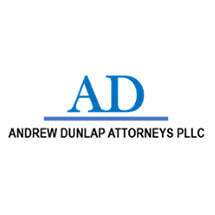 With this wide and varied legal and business background, Andrew Dunlap Attorney, PLLC, is highly qualified to handle all manner of complex labor and employment issues and disputes for his clients.